Though I loved the vision we were working toward, I was very disconnected from it. I think I may have slowly grown to even hate it. When it became obvious that I was burnt out, uninspired, and not feeling creative, I escaped to a sabbatical of silence and creativity. For most entrepreneurs, their company is their life’s work. I started working on what would become Move This World when I was 21 years old, during my Fulbright Scholarship. I was a bright eyed, optimistic dancer wanting to combine my passion and purpose to help people connect to themselves and one another using the power of creative expression. I’m still a dancer, but bright eyes and optimism soon gave way to the reality of being a Founder. Suddenly, in 2016, I found myself on day 12 of sitting in complete silence for 16 hours a day without making eye contact with anyone in a Tibetan Buddhist Monastery in northern India. It was part of a silent meditation retreat. My dear friend and personal accountability partner says that I “ran away” and that I “disappeared.” The reality was, I had escaped from my first baby: Move This World. 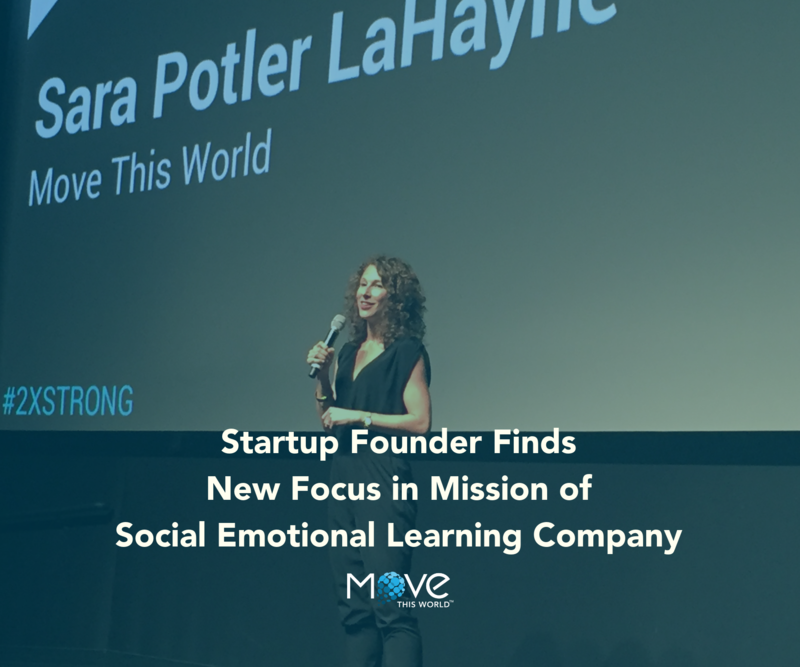 I started Move This World to help people authentically connect to themselves and express what they’re feeling. As a lifelong dancer, I believe in the power of creative expression to most effectively achieve that goal. At that time, we were delivering direct service to students and teachers, engaging them directly in the work of self care and emotional awareness, using creative expression and movement as our vehicle. Before I knew it, I was not facilitating sessions. I was not creating curricula or programming. I was not writing content. Instead, I was raising money and convincing people who had never thought about self work to care about it for teachers and students. I was managing staff. I was putting out fires. I was monitoring cash flow. Though I loved the vision we were working toward, I was very disconnected from it. I resented what I had built. I think I may have slowly grown to even hate it. So when it became obvious that I was burnt out, uninspired, and not feeling creative, I escaped. I escaped to a sabbatical of silence and creativity. Anyone who’s sat in silence and meditated for long periods of time knows that it is uncomfortable. Physically, your body is not meant to sit in that way for that long. Mentally, you grow exhausted trying to control your mind and your thoughts. Emotionally, you are staring all of the things you dislike about yourself smack in the face. The wonder of it all is that it passes. You surrender to the experience. You eventually ignore the pain in your hip or lower back. You slowly settle your mind and focus in on your breath. With time, you acknowledge your areas of growth with compassion and patience. It was during this “escape” or “flee from my reality” that I was actually brought back to reality. I sat in the discomfort and the pain. I moved through it. There has been pain in building Move This World. But each time I experience a setback, I know that it’s temporal. Everything is. Recognizing the ephemeral nature of everything, even the baby I birthed, my company, has given me strength. Pain happens, and then it passes. It’s been two years since my vow of silence, we are now doing better than ever. We’re working with over half a million students across 25 states. We’re seeing students effectively identify, express and manage their emotions. My team is working together better than any team I’ve ever managed. Someone once told me that self work hurts, in the way that it should. When the silence ends, awareness is possible. Building Move This World has been the ultimate journey in pain. There’ve been more lows and deeper valleys than mountain tops so far. But because I’ve climbed those mountains and ridden those waves, it’s given me the calming confidence to know that I can tackle any mountain, any challenge, any fire. So when I do get knocked down again, and it will happen soon I’m sure, I will surrender to the discomfort and the suffering and know that it will pass. I will return to my breath, my knowledge that the challenge is ephemeral, and remember the rewarding gratification of the picnic and the mountain top that I will reach again. This article was originally posted on EdWeek Market Brief on November 16th, 2018.